The Ruby Red 2008 Harley Fatboy For Sale has $5,000.00 in performance and appearance upgrades, which includes: Vance & Hines exhaust, Detachable Windshield, Saddle Bags, Race Tuner, Stage 1 Air Cleaner, Highway Bars, Luggage Rack, Backrest and lots of other accessories. only 10,000 miles on it. The value of this motorcycle has been placed at over $18,000.00 and yet I'm only wanting $15,000.00. 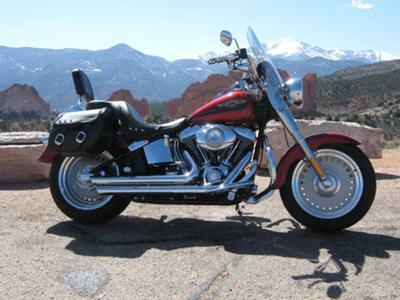 The motorcycle for sale is located in Colorado Springs, Colorado )and I am interested in hearing from serious inquires please) and you can leave your questions and contact information in the space below provided by Strike Lightning and I will get back with you as soon as possible. Strike Lightning would also encourage bikers to submit a review of the 2008 Harley Fatboy For Sale to help potential buyers make informed decisions and to benefit the biker community as a whole.